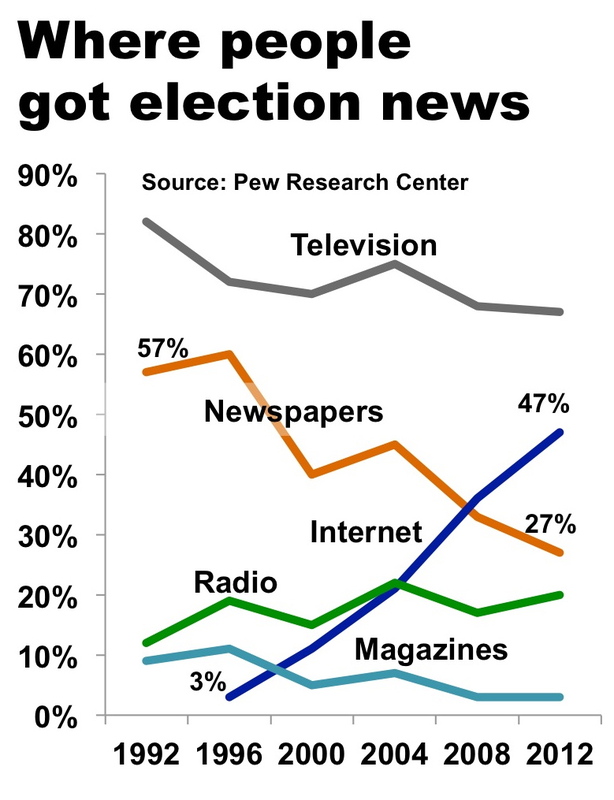 In 2008, the Internet and newspapers were tied in the number of people who turned to each them for news about the presidential election. This year, the Internet absolutely buried newspapers as the preferred source for campaign news. The dramatic shift in the relevance, authority and influence of newspapers on this most consequential of news stories was revealed in a comprehensive post-election survey released last week by the Pew Research Center. The study adds to the accumulating evidence – as discussed here and here – of the profound cultural and commercial challenges facing local publishers. Nowhere are the challenges more evident than in the strikingly different ways Americans consumed election news in 2012 than they did a mere four years earlier. While newspapers and the Net each were cited in 2008 by approximately a third of Americans as their go-to outlets for political news, Pew found that the number of people in this year’s contest relying on newspapers plunged to 27% while those using the web soared to 47%. 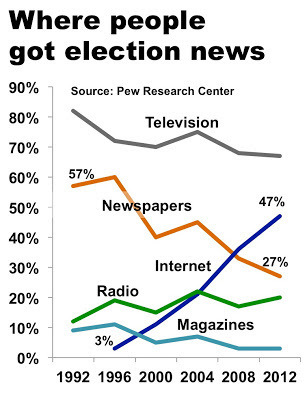 As illustrated in the chart below, television remained the top source for campaign news, sustaining the dominance it has enjoyed since Pew began asking the question in 1992. The sharp contraction of the newspaper audience in the last decade underscores the need for publishers and editors to seriously re-examine the coverage they offer in both print and digital media. It is not going to be easy, because print cannot match the in-the-moment immediacy of television and the web. And the digital offerings of most publishers, which tend to emulate print in substance and sensibility, generally lack the intimacy and interactivity of Twitter, Facebook, YouTube, blogs and host of other user-generated media. While most newspapers bannered the outcome of the presidential election on the morning after President Obama won his second term – and I frankly can't imagine what else they could have done – the big news was old news to almost everyone in the land. The reason the news looked so old is that anyone who cared about the election had been monitoring the results in real time on the previous evening. In its post-election census of voters, which also discovered a widespread distaste for the tenor and tone of the presidential campaign, Pew found that 78% of respondents followed the results of the voting on election night. Of those monitoring the ballot count, 92% tuned watched television and 34% used the web. In a significant new development in this election, Pew found that a substantial portion of individuals consumed the news simultaneously on multiple screens. Fully 39% of voters between the ages of 18 and 39 – and 28% of those between the ages of 40 and 64 – watched the returns on television and online at the same time. Multi-screen use was only 9% among those over the age of 65. Pew did not ask whether people passively consumed political news on the digital platforms or whether they actively commented on it. But the anecdotal evidence suggests a number of people were having quite a conversation among themselves. As but one measure, Twitter reported that it handled 31 million “election-related” tweets on Nov. 6, which represents a 17-fold increase over the 1.8 million messages on election day in 2008. To be sure, the election generated historically high traffic at newspaper websites, too. Traffic at the New York Times website was 75% higher on election day this year than it was in 2008, according a source at the paper quoted by the Nieman Journalism Lab. But the ancient “it's-not-news-until-we-say-so” mentality was alive and well at NYTimes.Com, which took until 12:03 a.m. (all times EST) on Nov. 7 to confirm the Obama victory that NBC called at 11:12 p.m. on the prior day. The peak Twitter traffic commenting on the outcome occurred at 11:20 p.m. While the Times merits respect for the values and traditions that caused it to be far more cautious in calling the race than most TV news organizations and websites, the unfortunate perception is that the newspaper was sluggish and out of touch in comparison to the growing array of video and digital competitors vying for audience and advertising dollars. If newspapers don’t find a way to reassert their relevance in a world of real-time media, they will become increasingly marginalized. But NYT had Nate Silver's 538 blog in all its many dimensions. I'm assuming Pew filtered out newspaper websites from its "Internet" percent? If not, it's a bit confusing on how to define newspaper reporting. Was "newspaper" print only? Newspaper endorsements: Out of step? How confident are publishers, really? Is there a tomorrow for USA Today?